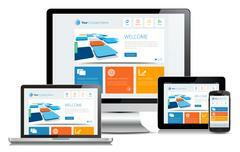 Virtual Vision can help - Every Site we build is Mobile Responsive. What does this change mean for your business? If your website is not mobile friendly, and/or mobile responsive, then your site will not rank as high as websites that ARE mobile friendly. This would mean that mobile-friendly sites are going to start getting more traffic, and non-mobile-friendly sites will start to get less traffic... 20-30% less traffic in some cases. Statistics show that 80% of all US consumers search for online shopping sites and local business online on their smartphone. The expected shift from desktop to mobile finally happened in 2014 as mobile browsing took over desktop browsing. This will continue to gain popularity in the year ahead. One website for all devices, so only one website has to be created and maintain. There is no need to create a specific content for mobile devices, while you still enjoy the benefits of your desktop website SEO on mobile devices. If you would like a quick quote on how much it would cost to convert your current website to a Responsive, Mobile Friendly Website. Click Here, and we will contact you within 1 business day for a Free Review and Quote.